An upbeat, easy to read new white paper proving that CRM software is much more than a contact management, it transforms your entire business. A month ago, I wrote (at a very high-level) about Axonom’s contribution to the CRM Software Blog’s “24 Wildly Creative Ways…” white paper. Today, I want to dive a little deeper and share more details on this white paper. Read below to see who should download it, why spend the time to read it, who contributed, and then take a peek at our submission. The CRM Software Blog white paper was written for companies who want to prove the business value of CRM software, evaluate the flexibility of Microsoft Dynamics CRM, or be inspired to use CRM in wildly creative ways for their own organizations. 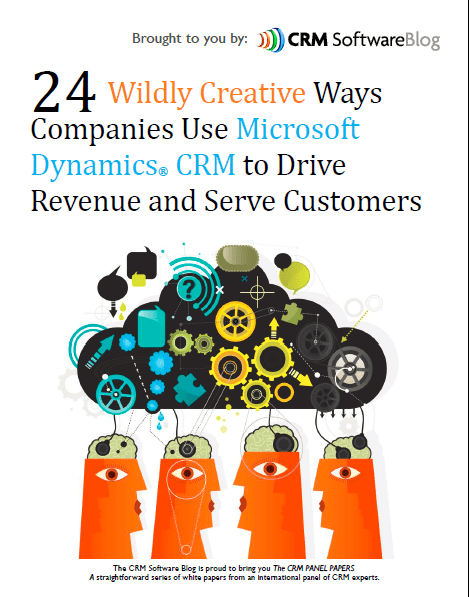 24 Wildly Creative Ways Companies Use Microsoft Dynamics CRM to Drive Revenue and Serve Customers is a fun look at how real companies are using Microsoft Dynamics CRM every day, and it is presented in an upbeat, engaging format. This white paper is the first in the CRM PANEL PAPERS series presented by an international panel of CRM experts at CRM Software Blog. The CRM Software Blog compiled real-life examples from Microsoft Dynamics CRM experts worldwide into an upbeat, easy to read new white paper proving that CRM software is much more than just contact management, it can transform your entire business. If you are currently evaluating the need for CRM software this white paper can help prove the business value. If you are thinking of upgrading an existing CRM system, the examples in this document will help you assess the flexibility of Microsoft Dynamics CRM. And if you already use Microsoft Dynamics CRM it will give you ideas on how to use your system in new ways. A key takeaway is that you may not need multiple software systems to accomplish various business goals when everything can be done within one system: Microsoft Dynamics CRM. Work right alongside your customer to configure an order and send the quote immediately from your tablet device. 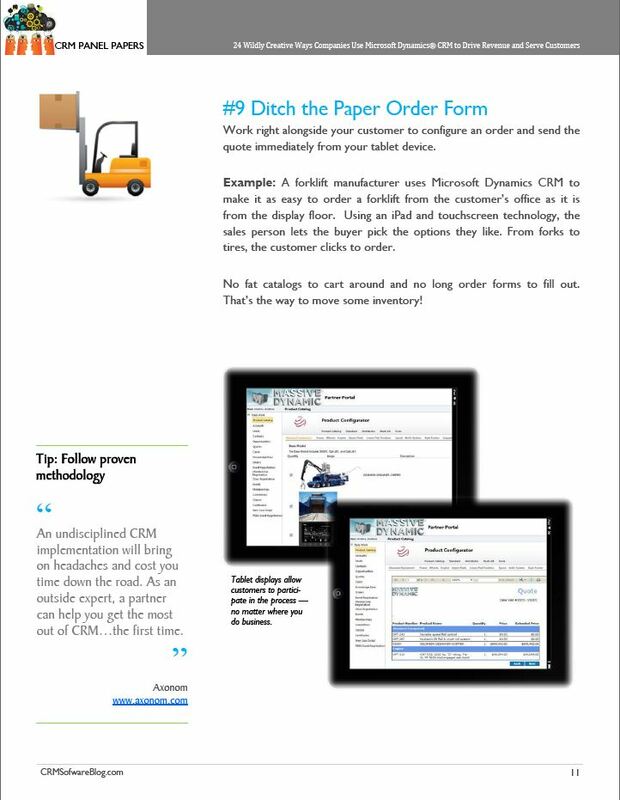 Example: A forklift manufacturer uses Microsoft Dynamics CRM to make it as easy to order a forklift from the customer’s office as it is from the display floor. Using an iPad and touchscreen technology, the sales person lets the buyer pick the options they like. From forks to tires, the customer clicks to order. No fat catalogs to cart around and no long order forms to fill out. That’s the way to move some inventory!